Planning a meaningful wedding ceremony that has relevance to the bride and groom and also honors the beliefs and traditions of both family’s cultures can be difficult at best. At LOLA we do a great many ceremonies that honor different religions, cultures and individuals. 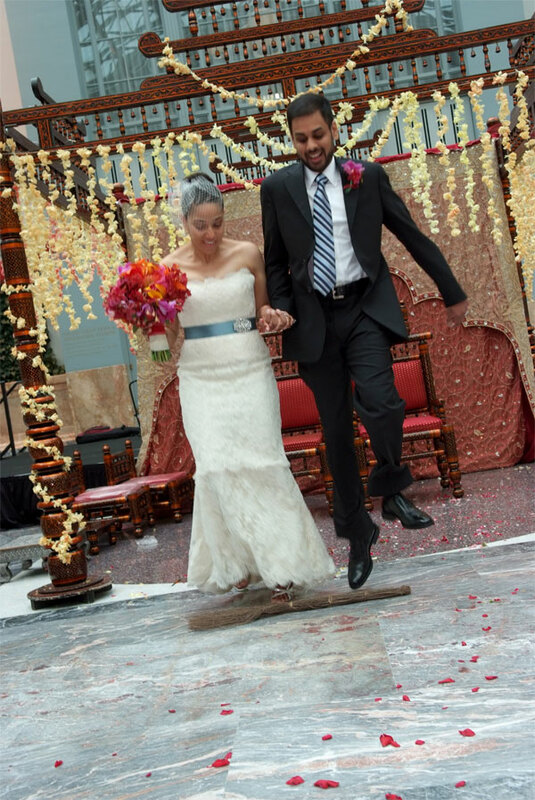 A great example of this was the wedding of Jade and Raj on June 21st at Harold Washington Library. They celebrated with a modified traditional Hindi ceremony followed by a secular ceremony that talked about their personal love story. They exchanged personally written vows, and then finished with a traditional African American “broom jumping” ceremony. Family and friends were incorporated into the ceremony in many different and personal ways – including a portion of the ceremony where everyone wrote messages on ribbons that were then collected and will later be tied into their “broom.” This also served as a break between ceremonies where the bride and groom changed from their Hindi clothing to their western attire.